Microsoft introduced a bevy of new devices on-stage during its 'Back to Black' hardware event in New York City last night, including a new Surface Pro 6, Surface Laptop 2, and Surface Studio 2. The company also unveiled its first foray into high-end personal headphones with the imaginatively named Surface Headphones. 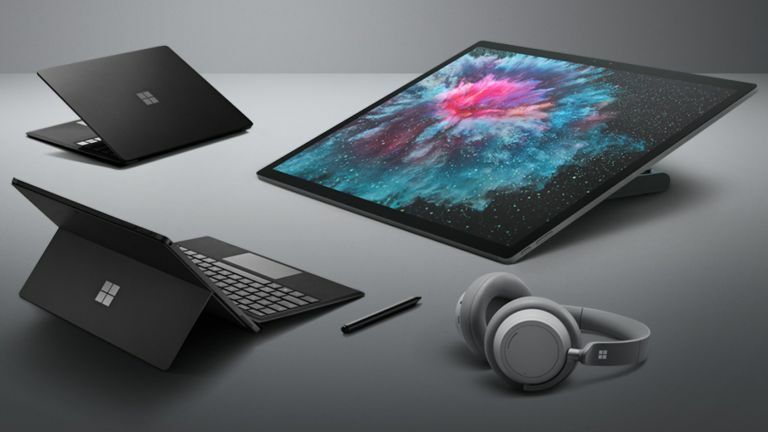 As you might expect from the 'Back to Black' hardware event, all of the new devices from Microsoft will be available in a gorgeous-looking matte black finish. Unfortunately, the new paint job is one of the only visible changes to the new Surface devices – with most of the major updates taking place on the inside. The latest Surface Pro two-in-one looks very similar to its predecessor. In fact, it's so similar that Microsoft forgot to include support for USB-C on the new device – despite these ports quickly becoming the universal standard. However, it's what is on the inside that counts – and Microsoft claims the Surface Pro 6 is around 67% more powerful than the previous iteration of the device, thanks to the addition of an 8th generation Intel processor and new cooling system. The Surface Pro 6 sports the same 12.3-inch, 267 pixel-per-inch display, although Microsoft says it now has a higher contrast ratio. Battery life has also been stretched to 13.5 hours thanks to the efficiencies gained by the latest Intel processor. You’ll be able to pre-order Microsoft’s newest tablet today, with prices starting at £879 ($899) for the entry-level Intel Core i5 model with 8GB of RAM and a 128GB SSD. However, the Surface Pro 6 can be maxed-out with a whopping 16GB of RAM, Intel Core i7 and a 1TB SSD, which will set you back a cool £2,149 ($2,299). The first devices will start to ship on Tuesday, October 16, 2018. The Alcantara-covered Surface Laptop is back with a new 85% faster 8th Generation quad-core Intel Core processors, quieter keyboard, and matte black finish. Microsoft has also added OmniSonic speakers, which it claims will offer laptop users a more premium sound when watching video or listening to music on the notebook. The display on the Surface Laptop 2 has also seen an upgrade – now boasting more than 3.4 million pixels to deliver a 1,500:1 contrast ratio. The upgraded internals have bumped-up the price of the device, with the entry-level Surface Laptop 2 now starting from £979 ($999). That model ships with 8GB of RAM, 128GB of internal non-upgradeable storage and an Intel Core i5 processor. You’ll be able to pre-order it starting today to arrive on October 16. Microsoft saved the biggest updates for its workhorse all-in-one desktop computer – the Surface Studio. The latest model boasts newer Nvidia Pascal graphics for 50% greater graphics performance. Microsoft is also using Kaby Lake processors in the Surface Studio, which isn't the latest chip from Intel, but should offer noticeable speed bumps. The 28-inch display has now been upgraded to an all-new Brilliant PixelSense Display, which Microsoft claims is 38% brighter and 22% higher contrast. The Surface Studio 2 is also the only machine announced at the 'Back to Black' event that gained a USB-C port, as well as built-in Xbox Wireless support. The Surface Studio 2 is also available for pre-order now starting at $3,499 (roughly £2,700), with the maxed-out Intel Core i7, 2TB SSD and 32GB of RAM model setting you back $4,799 (some £3,692). While there are always rumours that Surface VP Panos Panay and his team are busy working on a flagship smartphone, nobody was expecting a pair of headphones! Microsoft pulled the rug from under everyone when it unveiled the high-end personal headphones on-stage during the hardware event. Dubbed Surface Headphones, the new cans will cost $349 (about £270) when they launch sometime later this year. The smart headphones are designed to work wirelessly and deliver active noise cancellation via the eight built-in microphones. Microsoft lets wearers adjust the volume and noise cancellation levels with spinning on-ear dials, with some 13 levels of ambient noise control – so you can find the perfect balance between perfect isolation, and blaring traffic jam. As you'd expect, voice assistant Cortana comes built-in, allowing you to tell the headset to start your music, read your emails or start a conference call with your voice using the two beam-forming microphones built-into the cups.